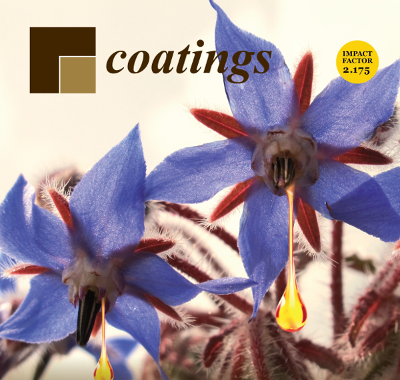 We are pleased to announce the Featured Journal of this Month—Coatings. Coatings (ISSN 2079-6412) is an international, peer-reviewed and open access journal devoted to the science and engineering of coatings, thin and thick films, surfaces and interfaces. Since it was founded in 2011, 449 articles have been published, 39 of them cited 10 times or more (h-10 index). The current Impact Factor is 2.175, and the five-year impact factor is 2.096. Dr. Alessandro Lavacchi, Editor-in-Chief, believes that the journal fulfills an important role in the community of researchers and developers in the field of coatings—a field that will continue to play a vital role in modern technology for many years to come. Coatings publishes original research papers and brief communications that report on the latest findings together with review papers that mark the point on the state of the art research. Here is a selection of highly cited papers from the last 12 months, highlighting the latest research in the field of coatings. Transparent liquid repellent coatings with exceptional wear and abrasion resistance are very demanding to fabricate. The most important reason for this is the fact that majority of the transparent liquid repellent coatings have so far been fabricated by nanoparticle assembly on surfaces in the form of films. These films or coatings demonstrate relatively poor substrate adhesion and rubbing induced wear resistance compared to polymer-based transparent hydrophobic coatings. However, recent advances reported in the literature indicate that considerable progress has now been made towards formulating and applying transparent, hydrophobic and even oleophobic coatings onto various substrates which can withstand certain degree of mechanical abrasion. This is considered to be very promising for anti-graffiti coatings or treatments since they require resistance to wear abrasion. Therefore, this review intends to highlight the state-of-the-art on materials and techniques that are used to fabricate wear resistant liquid repellent transparent coatings so that researchers can assess various aptitudes and limitations related to translating some of these technologies to large scale stain repellent outdoor applications. This review focuses on Cu/TiO2 sequentially sputtered and Cu-TiO2 co-sputtered catalytic/photocatalytic surfaces that lead to bacterial inactivation, discussing their stability, synthesis, adhesion, and antibacterial kinetics. The intervention of TiO2, Cu, and the synergic effect of Cu and TiO2 on films prepared by a colloidal sol-gel method leading to bacterial inactivation is reviewed. Processes in aerobic and anaerobic media leading to bacterial loss of viability in multidrug resistant (MDR) pathogens, Gram-negative, and Gram-positive bacteria are described. Insight is provided for the interfacial charge transfer mechanism under solar irradiation occurring between TiO2 and Cu. Surface properties of 2D TiO2/Cu and TiO2-Cu films are correlated with the bacterial inactivation kinetics in dark and under light conditions. The intervention of these antibacterial sputtered surfaces in health-care facilities, leading to Methicillin-resistant Staphylococcus Aureus (MRSA)-isolates inactivation, is described in dark and under actinic light conditions. The synergic intervention of the Cu and TiO2 films leading to bacterial inactivation prepared by direct current magnetron sputtering (DCMS), pulsed direct current magnetron sputtering (DCMSP), and high power impulse magnetron sputtering (HIPIMS) is reported in a detailed manner. Ti and its alloys are the most commonly-used materials for biomedical applications. However, bacterial infection after implant placement is still one of the significant rising complications. Therefore, the application of the antimicrobial agents into implant surfaces to prevent implant-associated infection has attracted much attention. Scientific papers have shown that inorganic antibacterial metal elements (e.g., Ag, Cu, Zn) can be introduced into implant surfaces with the addition of metal nanoparticles or metallic compounds into an electrolyte via micro-arc oxidation (MAO) technology. In this review, the effects of the composition and concentration of electrolyte and process parameters (e.g., voltage, current density, oxidation time) on the morphological characteristics (e.g., surface morphology, bonding strength), antibacterial ability and biocompatibility of MAO antimicrobial coatings are discussed in detail. Anti-infection and osseointegration can be simultaneously accomplished with the selection of the proper antibacterial elements and operating parameters. Besides, MAO assisted by magnetron sputtering (MS) to endow Ti-based implant materials with superior antibacterial ability and biocompatibility is also discussed. Finally, the development trend of MAO technology in the future is forecasted. Posted in Journal of the Month, New and Notable, Open Access Publishing and tagged anti-graffiti coatings, coatings, Featured Journal of the Month, magnetron sputtering, Titanium-Based Implants.